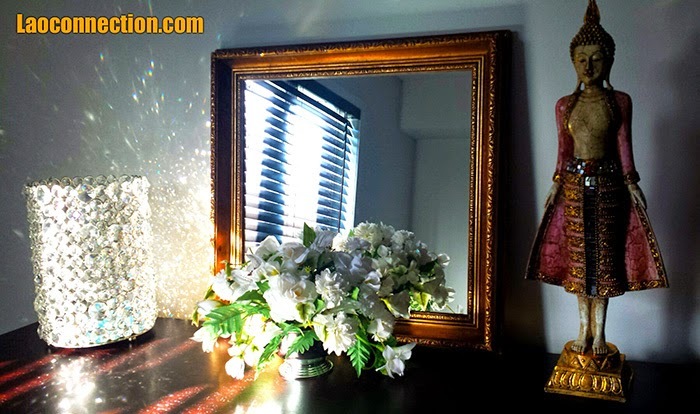 Integrating Lao items (like a nice textile or a Buddha statue) with modern sensibilities into one's decor can be quite easy. Having one's culture reflected in home decor doesn't necessarily mean having to go wild on any single theme either. Take a look at this. It's a mix of antique vintage items combined with new store bought ones. A combination of modern and traditional, ethnic and mainstream. Remember: Choosing the right accent piece(s) is key and it's important not to clutter. I created this little vignette that I'm calling "Reflections". "Reflections" - I mean it both figuratively and literally. Not only are there wonderful reflections going on but it's a wonderful place to actually reflect and think. Of course, no special corner of mine is complete without a Buddha (who was all about mindfulness and reflecting, after all!). Side Note: In a previous post, I shared with you my "Corner of Zen". If you haven't seen that, check it out here. Having a space that can serve dual purposes of being both aesthetically pleasing and inspiring can be a challenge to create in one's own home. Do you have inspiring Lao spaces? Or spaces that exude a Lao chic look? Share below or on our Facebook page. Hope you enjoy our examples. Does Laos Have Minimum Wage?